Sydney Shop Girl: Spendy Accessorizing. Sushi E, Sydney. Spendy Accessorizing. 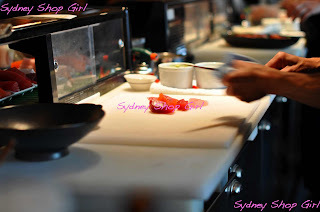 Sushi E, Sydney. And on the seventh day she finished the deep thinking that she had thought, and she rose and rifled through her wardrobe to try and find something to wear to Sushi E for lunch. This proved to be harder than she had anticipated on account of the miserable skies outside and her well documented inability to wear heels to catch public transport and then pound the pavement of George Street. Bag and wrap - Louis Vuitton. Finally, she gave in to her tried and tested theory of spendy accessorizing. If one dares to break with accepted convention and wear no make up, bad hair, skinny jeans and ballet flats to weekday lunch in the land of the suits, one should at least have the decency to accessorize the unkempt out of the ensemble. It's been two paragraphs already. Time to snap out of this referring to myself in the third person business. 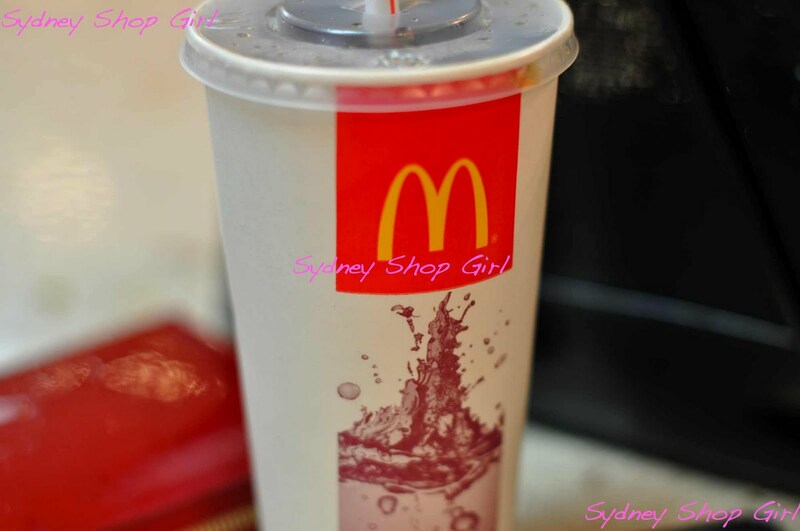 It must have been the colours of the banners that made me decide that pre hydrating with a large Coke Zero at Maccas before lunch was a good idea. I also got myself a packet of Fisherman's Friends mints from the kind ladies and gents who were wheeling this half ship trolley down George Street. Am I now fully set up for a night on the town or what? The moment of truth - Sushi E @ The Establishment is not Sushi Choo @ The Ivy. Despite all this excitement, I made it to Sushi E to meet Mr SSG for lunch. And this is where my plans came a little unstuck. The original plan was to support Mr Hemmes' lunch time special offers at the Ivy. 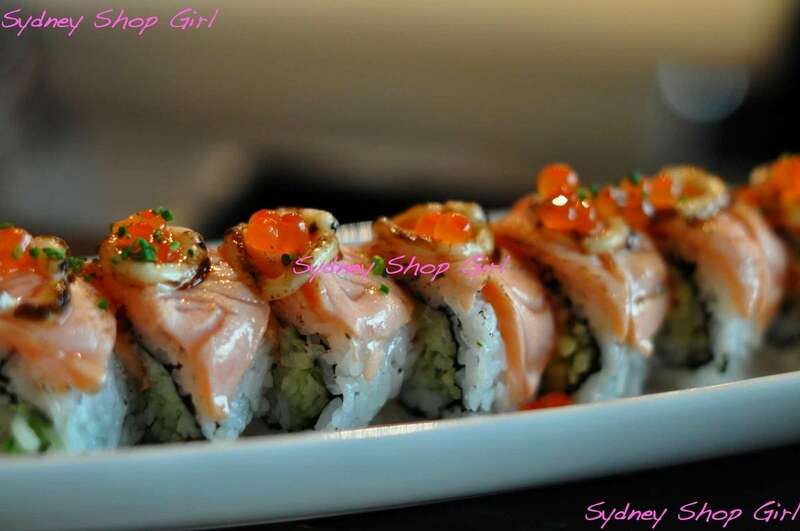 How was I to know that Sushi E and Sushi Choo were two different places? 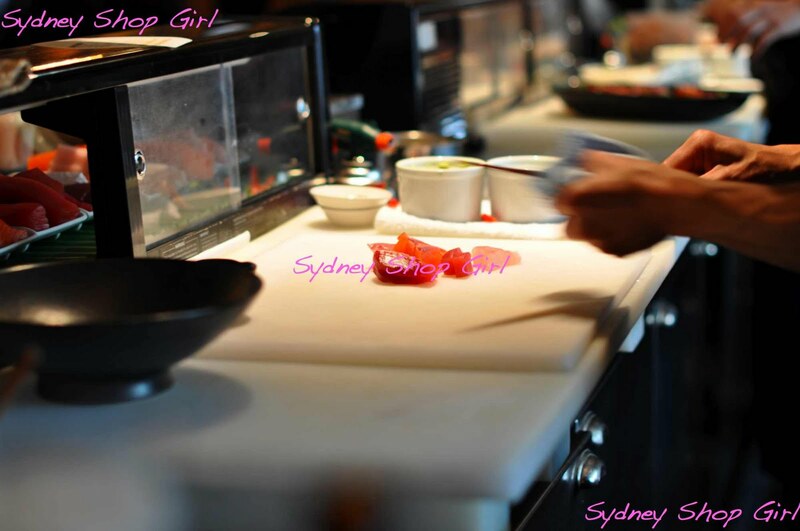 And that Sushi E were not doing a $38 'Let's Do Lunch' set menu involving fish fillets with ponzu sauce? 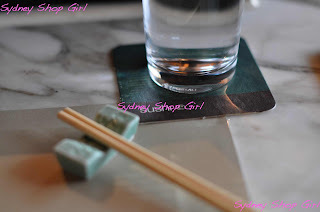 I was asking myself these questions as we found ourselves seated at the sushi bar. I don't know about you but by this stage I was thinking that a set lunch menu wasn't going to be on the cards. A moment of realization had occurred. There was no turning back now, though. After not eating sashismi for the last 3 months and still not having fully addressed my sushi deficit, I was going to make the most of our meal today. I have no idea what this machine is about. Ideas? 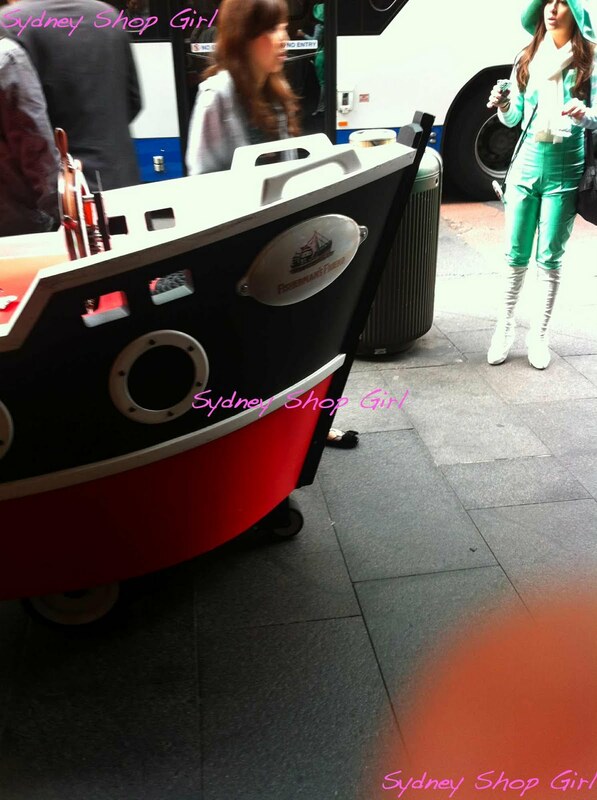 There were 2 sushi chefs working at the bar which sat around 30. We started with edmame. 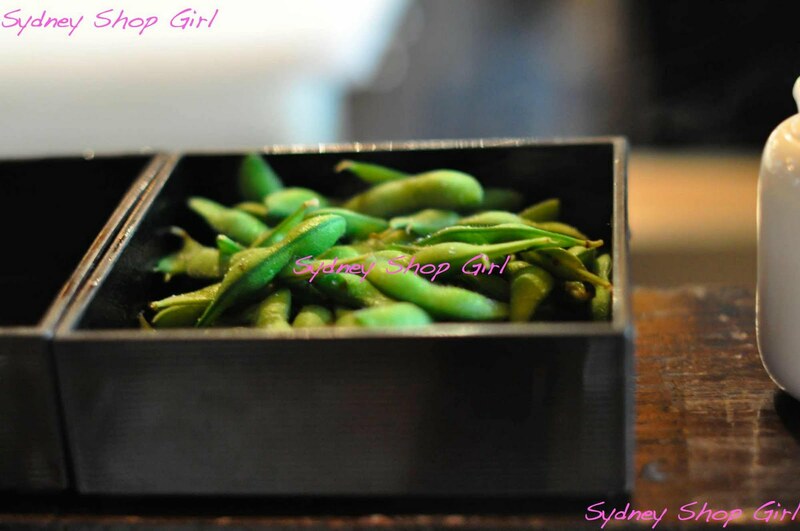 Oh I love edamame. They go so well with sparkling wine. Then we shared a large plate of sashimi. Seriously, the freshest sashimi I've ever tasted. It was heaven. 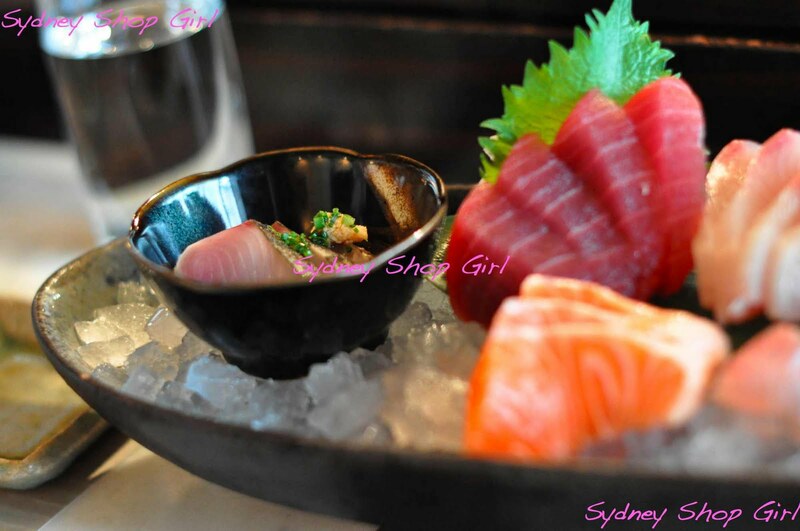 Large sashimi, 18 pieces - $49.50. It got me thinking back to Japan and how the fish served there was slightly different. It was delicious but the tastes were not as familiar to me as the types of fish I'm used to when sashimi is served in Australia. Like so many other cuisines, Japanese food often has to be reinterpreted in other countries due to the availability of produce and local tastes. Probably more the former these days, most people nowadays search for authenticity when eating different cuisines. Atlantic Roll (inside out) - $21.00. I was swooning over the Atlantic Roll too. The mayo wasn't too heavy and the roe and flame torching of the whole ensemble did it for me. After splattering soy over my place mat, I forgot that I was in one of the fancier hotel complexes in town and just enjoyed the food. It wasn't hard to tune out from my surroundings to be honest, it was so quiet and relaxed. The sushi bar is partitioned off from the main eating area where lots of suit type people were talking earnestly at each other over their blackberries whilst taking their meals at low lying tables and lounge chairs. I'm just not never going to be a card carrying member of corporate Austalia. I can do the clothes but geeze I am not built to be able to eat a full meal and then stand from a well cushioned sofa. With or without sparkling wine. 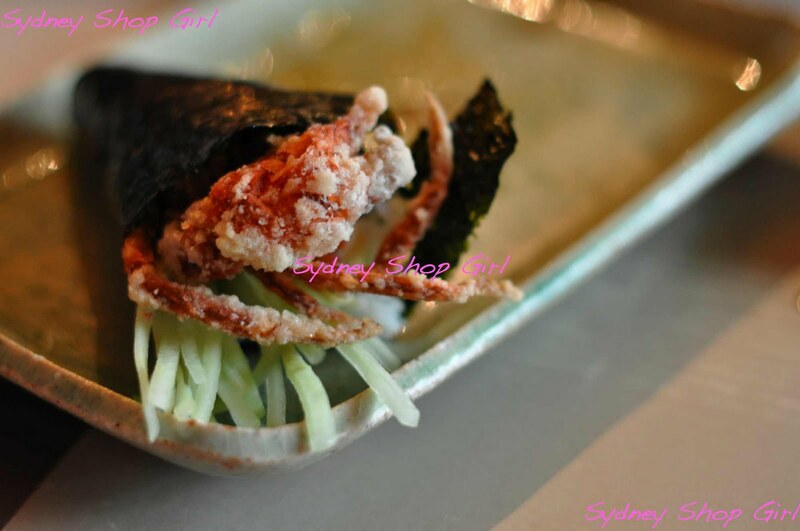 Soft shell crab hand roll - $18.50 each. 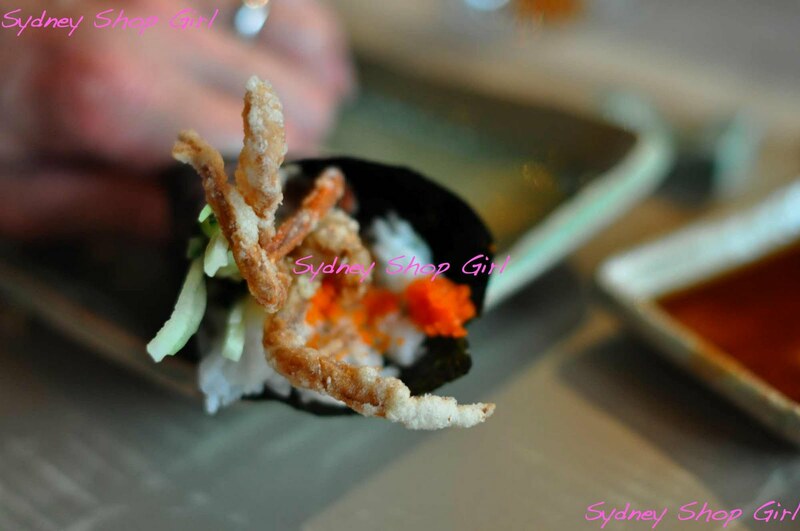 Soft shell crab was a major food trend in Sydney a few years back. I see no reason for it to return to food trend Siberia. We finished our meal with a spider hand roll each. 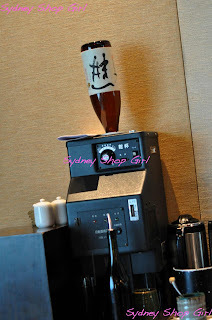 Because our bill was now around $150, I think more than one photo of the hand rolls is in order. I love the crunch of fried crabs. The roll also featured the refreshing crunch of cucumber and flavour from the spicy tobiko and chives as well as some jalapeno mayo. We were given a little dessert each at the end of the meal. 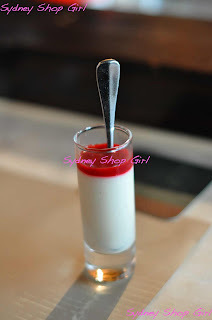 A strawberry panna cotta style dessert. It was fabulous meal and I would definitely return again. The prices are right up there but the food more than justifies the cost. 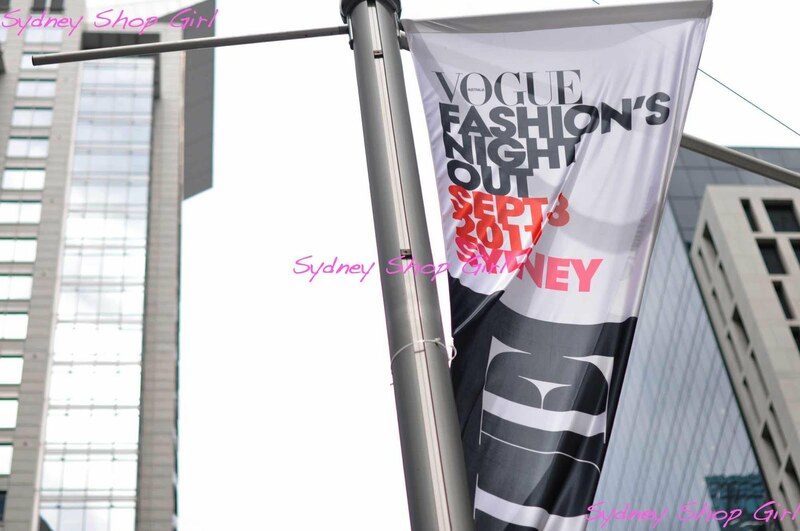 Fashion's Night Out, Sydney 2011 - here I come! 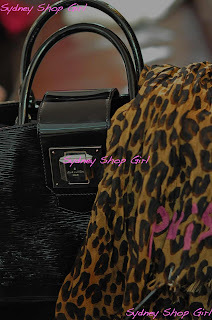 Love your bag and wrap! 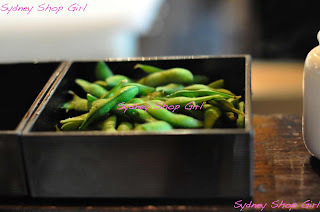 I too believe you can get away with simple comfortable clothes as long as you follow the spendy accessorising rule.And edamame is one of my favourite foods. 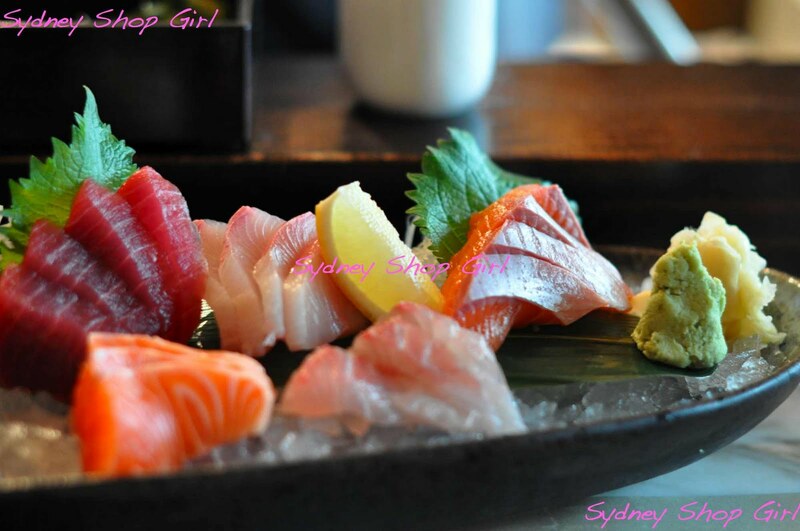 Oh my mouth is watering looking at that sushimi! If I didn't have leftovers currently heating in the microwave I would be heading out to eat some right this second. 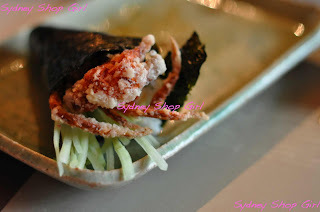 My standard fare is the cuttlefish, wagyu beef roll (you must try this, they wrap the beef outside the roll), spider crab roll and then the agadashi tofu. Love love love this place. The sushi looks yummy! And that dessert :) Swoon! I have been listening to a bit of the Basement Birds lately. There is a catchy song called Bus Stop, featuring Bob Evans and Julia Stone, and a line in it says "sucking on a Fisherman's Friend" - it may well be the only song ever to mention Fisherman's Friends. You should look it up! Peak Hour On The Information Superhighway. A Super Easy Salted Caramel Tart. The Thoughts Of A Friday Night Football Widow. Mrs Clooney and Mrs Carey. Summer In A Soft Taco. Just A Little Team Jolie. Poppycock. 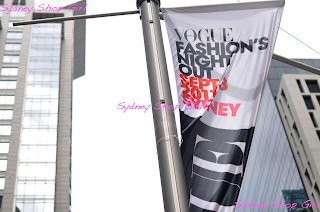 Fashion's Night Out, Sydney 2011. From Pasta to Fast Food. The Week In Food. Coffee, Coping and The Big C.
The SSGs Take A Day Trip to Costco.